We continue to build the structures for significant change for children and families affected by parental alienation. With only two weeks to go now until we welcome delegates to the European Association of Parental Practitioners Conference, we are joining hands with our colleagues around the world to raise this issue to public consciousness. Starting with the PASGNordic Conference next week in Stockholm, researchers, practitioners, MPs and policy makers from around the world, will meet in Europe to consider the ways in which a child’s rejection of a parent after divorce and separation, can be prevented as well as properly recognised and treated in a manner which is transparent and effective. There is no time to lose, for we now have generations of children whose ‘decision’ to reject a parent after the divorce or separation of their parents, is showing the impact experts have always predicted. We now have a generation of children in the UK who can trace the problems they face in the relational world, back to the harm that was done to them when their ‘wishes and feelings’ were upheld by unaware practitioners. These children who are now adults, are the people who will, in my view, help to stop the wilful disregard of the evidence and the knowledge and the practice which assists children in these circumstances. The EAPAP Conference Programme is an exciting line up which is designed to launch a new phase of change in Europe and I am delighted to launch it today. 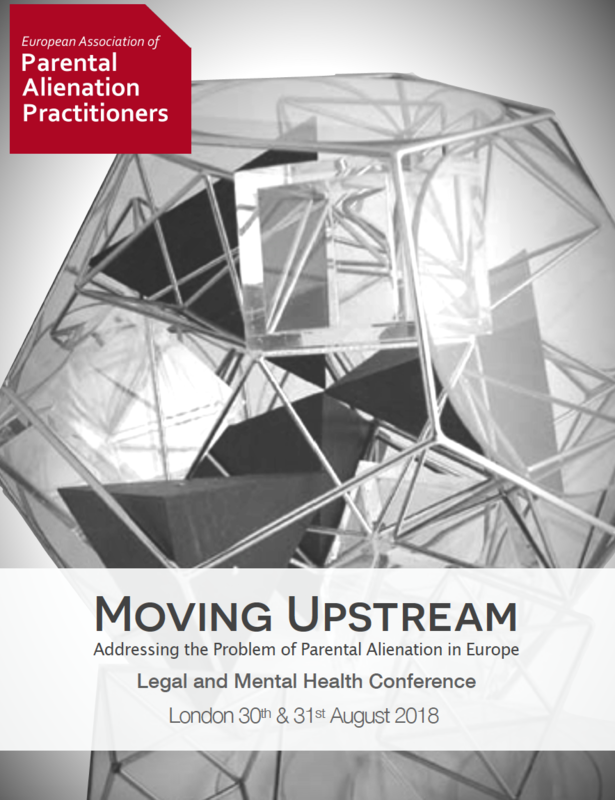 Divided into two days, the Conference will examine the way in which the legal and mental health interlock or partnership, is required to manage cases of parental alienation to a successful conclusion. Here is the programme for the two days (may be subject to slight changes in timing and running order). You will see from the programme that we are aiming towards the curation of the best standards of practice in working with parental alienation in Europe. This is a conference which is about doing something, not just talking about it. It is also a conference in which dialogue and opinion is actively being sought with delegates, so that we achieve, going forward, maximum recognition and support for the regulation of work with alienated children and their families in Europe. The Conference will set out the international standards of practice which EAPAP will launch and will demonstrate how the core models of effective practice can be adapted for different legislative settings. In the coming days I will unpack something of this and the Conference paper which will detail all of the outcomes and impact of the conference, will further outline this. The survey headlines will be available at the Conference and the full results will be available in a detailed paper shortly afterwards. These papers will go directly to all of the policy makers across Europe who have the power to make change. We are one movement with many hands and together we are making a difference for alienated children and their families all over the world. The Conference opens for registrations and networking at 8am on the 30th August. If you have booked and paid, please bring with you a form of ID to obtain your pass. The Conference opens at 9.30am and closes at 5pm each day. The workshop with Linda Gottlieb and Karen Woodall begins at 5.30pm on August 30th in the auditorium. I hope the Spanish will contribute. My case remains unsettled after over 14 years. I would love to see the comment made by this particular country. Also, another case, Beth Alexander and her twins in Vienna, this case was disputed by our Government without success.